Do you get tired of kneading? Sometimes, I do. Especially if I find myself with nothing interesting to think about. Because, let’s face it. Kneading is somewhat repetitive. It’s hand-wringingly repetitive. Others clearly have the same feeling. Some people resort to using machines to knead. But I’m not wild about using machines. They take up so much room and they’re so loud. And they aren’t easy to clean – I’m always worried about cutting myself…. 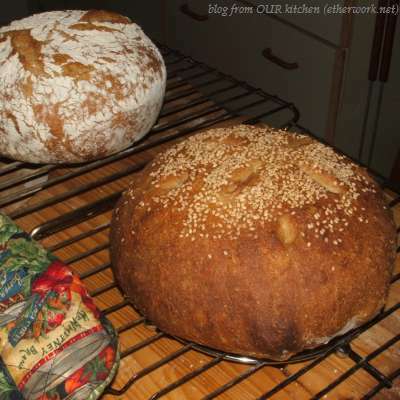 Other people, like Ken Forkish (Ken’s Artisan) and Chad Robertson (Tartine Bread), forgo kneading entirely and hand-mix and fold their bread doughs in a container. I tried this method, and it does work. Forkish's pincer method is especially satisfying. But the sides of the bowl aren’t clean.... That just goes against my sensibilities. ie: you can’t teach an old dog new tricks. Especially if the dog was old when it learned the first trick. When I first started making bread seriously, I read Julia Child’s instruction to wash out the mixing bowl before putting the kneaded dough into it to rise. I just can’t stop doing this. And it’s not just about obedience. It’s practicality. When the bowl is clean, the risen dough just plops out; note that I NEVER oil the bowl. That’s right. Never. Not to mention that Richard Bertinet’s turning and slapping kneading method is just too wonderful. After reading Chad Robertson's "Tartine Bread", Ken Forkish's "Flour Water Salt Yeast" and watching Richard Bertinet's Gourmet Magazine video showing how to hand mix and knead brioche, I have revised the way that I hand-knead bread. I still knead, using a dough scraper, but there is something really thrilling about plunging both hands into the dough. When hand kneading slack dough, I alternate between using Richard Bertinet's "lift, flip over, slap down" method and my own "hand wringing" method. Both methods are easy and both work very well. I use a dough scraper every so often to clean the board. So. Are you ready to throw away your big heavy electric mixer yet? I like hand-mixing my dough and will try your method soon! tks for sharing!